This article provides a high-level overview of the new and revised Standards and Interpretations that are effective for December 2018 calendar year-ends and subsequent accounting periods. Entities are, however, generally permitted to adopt the new and revised Standards and Interpretations in advance of their effective dates (refer to individual Standards and Interpretations for additional details). This article provides a summary of IFRSs and interpretations that an entity may elect to apply for the year ended 31 December 2018. A word of caution regarding early adoption of Standards and Interpretations in the case of entities that prepare financial statements according to IFRS as adopted by the European Union (EU). Standards, Interpretations and amendments to the existing standards, which were not endorsed for use in the EU, cannot be applied by the entities preparing their financial statements in accordance with IFRS as adopted by the EU. Where applicable, we have made reference to past issues of Accounting News dealing with the specific Standard or Interpretation in greater detail. These past newsletters are also available at www.dReport.cz. As always, entities should refer to the Standards and Interpretations themselves to identify all of the changes that may affect their particular circumstances. Where a Standard or Interpretation is adopted in advance of its effective date, disclosure of that fact is generally required. Even where there is no intention to implement a Standard or Interpretation in advance of its effective date, entities need to be aware of new Standards and Interpretations as they are issued, in order to comply with the requirement included in IAS 8 Accounting Policies, Changes in Accounting Estimates and Errors to disclose in their financial statements the potential impact of Standards and Interpretations in issue but not yet effective. This requirement is valid irrespective of whether a Standard or Interpretation have already been endorsed in the EU. We therefore recommend reviewing further newly issued amendments to standards and interpretations that will be approved by the date of the issuance of a company’s financial statements. We will be providing updates on these developments on www.iasplus.com and in our Accounting News. 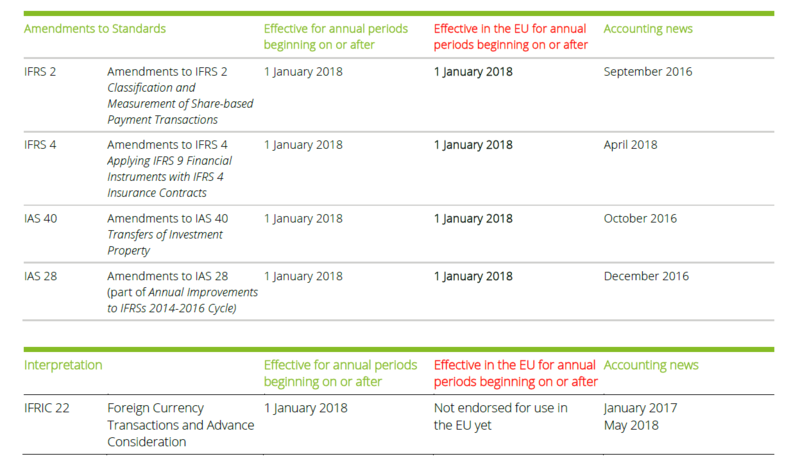 The effective dates of IFRSs issued by the IASB and IFRSs as adopted by the EU can be different. 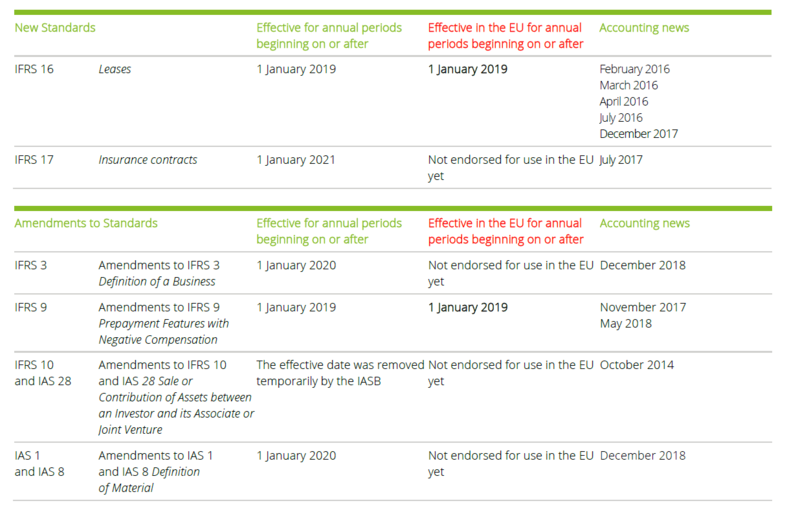 The following tables provide a list of new and revised Standards and Interpretations in issue as of 22 January 2019 that are either effective, or available for early adoption, for 31 December 2018 calendar year-ends.